Deputy Attorney General Rod Rosenstein and FBI Director Christopher Wray faced sharp questions about the Justice Department's independence on Thursday. WASHINGTON — The Republican-controlled House made an unprecedented demand for secret Justice Department documents Thursday as an increasingly ugly dispute over special counsel Robert Mueller's Russia investigation burst into full public view. Spurred by conservative backers of President Donald Trump, the House voted to approve a resolution "insisting" the Justice Department hand over scores of extremely sensitive internal documents by next Friday about the investigation into possible collusion between the Trump campaign and the Kremlin's 2016 election interference effort. 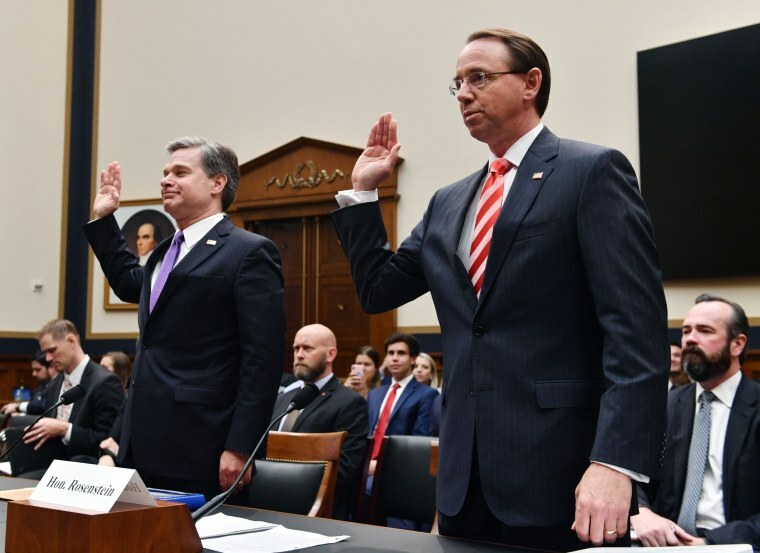 The vote happened as Deputy Attorney General Rod Rosenstein, testifying alongside FBI Director Christopher Wray during a day-long hearing of the House Judiciary Committee, came under attack by Republican lawmakers, while Democrats tried to interject in his defense. Among the most contentious exchanges came when Rep. Jim Jordan of Ohio accused Rosenstein, who appointed Mueller to lead the probe, of trying to hide embarrassing information from Congress. "Mr. Jordan, I am the deputy attorney general of the United States, OK? I'm not the person doing the redacting," Rosenstein responded. "I'm responsible for responding to your concerns ― as I have." "Whenever you have brought issues to my attention, I have taken appropriate steps to remedy them," he continued. "Your use of this to attack me personally is deeply wrong." At the heart of the dispute is a series of subpoenas for documents issued by Rep. Devin Nunes, R-Calif., the chairman of the House Intelligence Committee. Nunes has already been given access to the sorts of classified investigative documents that are rarely handed over to Congress, including applications for secret national security surveillance of Trump aides and detailed notes from FBI interviews, known as "302s." Among the documents Nunes recently requested were those pertaining to "any contacts" between "FBI informants" and/or "undercover agents" and 14 members of the Trump campaign, including Donald Trump Jr., according to a letter obtained by NBC News. That is the sort of request the Justice Department normally would resist. "We have not provided any documents that would interfere with an ongoing criminal investigation," a senior Justice Department official told NBC News. Rep. Zoe Lofgren, a California Democrat, said she had read the application to conduct surveillance on Trump aide Carter Page, and she believed that some information in it was so sensitive it could cost lives if revealed. She said she had never seen such information turned over to Congress in her 24 years in the House. If the Justice Department fails to comply with the House resolution, Republicans said they will move to hold Rosenstein in contempt of Congress or impeach him, though a vote to oust him from office is unlikely. In a letter to House Speaker Paul Ryan Wednesday, Rosenstein urged him not to move forward with the resolution, saying it failed to acknowledge the "extraordinary and unprecedented" efforts the Justice Department has made to turn over documents. But Ryan, who is retiring, cast his lot with House conservatives who have criticized Mueller, as he consistently has done. Democrats said Republicans want the documents only as part of their longstanding attempt to attack and discredit the Russia investigation on behalf of Trump, who regularly attacks the probe on Twitter. "This is collaboration with the executive branch, masquerading as oversight," said Rep. Adam Schiff of California, the ranking Democrat on the Intelligence Committee, in a speech on the House floor. The senior DOJ official said Rosenstein had to miss a meeting of deputy cabinet members and a national security meeting as the hearing continued throughout the afternoon, while Wray had to fly back from a work trip in Los Angeles. Wray and Rosenstein categorically disputed the sentiments expressed by Trump and his allies that the Mueller investigation had been infected by political bias. Trump has said it is led by "12 angry Democrats." "I do not consider myself an angry Democrat," Wray told Luis Gutierrez, an Illinois Democrat. Gutierrez asked Rosenstein, "Are you a Democrat?" Rosenstein replied, "I am not a Democrat, and I am not angry." Wray also noted that the Justice Department inspector general, while criticizing the conduct of FBI agent Peter Strzok, found that bias didn't cause the FBI to go easy on Hillary Clinton in the email investigation, as Trump has charged. "My understanding of it is that [the inspector general] found no evidence of political bias actually impacting the investigation that he reviewed," Wray said.